“No,” he said. “It’s an amplifier.” He stuck the probe into the winding hole, tapped the pendulum, and listened. It would tick one way but not the other. “Do you mind if I take it off the wall?” he asked. Of course, we wanted him to fix it, so we said yes. He approached it reverently, lifted it off the wall, and laid it gently on the table. Inside he found the invoice with a list of the things that had been repaired in 1982. He could read the name Garstang, and I remembered that was the name of the clockmaker. He couldn’t reach the top of the pendulum through the door. We gave permission for him to remove the hands and clock face. 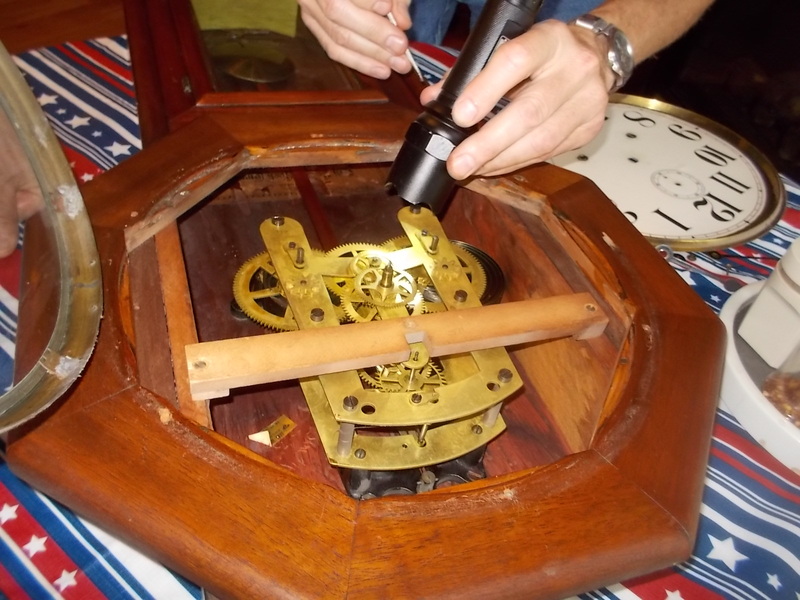 Peering with a flashlight, he discovered the pendulum had slipped and was not hanging correctly. Daryl said he liked knowing the stories about old clocks, and I supplied a brief history. My granddad had an 8th grade education and worked as a tinsmith. He went to Vanderbilt in Nashville and told the dean that he was there to become a dentist. This clock hung in the lab of Granddaddy’s office, covered in dust from the plaster of Paris dentists used back then. My dad had it cleaned and refinished when he moved his office to a ground floor storefront. Daryl pointed to oil on some pieces of the works and recommended a good cleaning. It may take a month or two, because he has several jobs ahead of ours. The poor old clock has hung motionless on our wall for eleven months. One more month is nothing. It will be great to have it back. I wonder if it will still say “Tock Tick” instead of “Tick Tock” as my mother insisted it did. After Dad’s retirement, it hung on the wall of their bedroom. 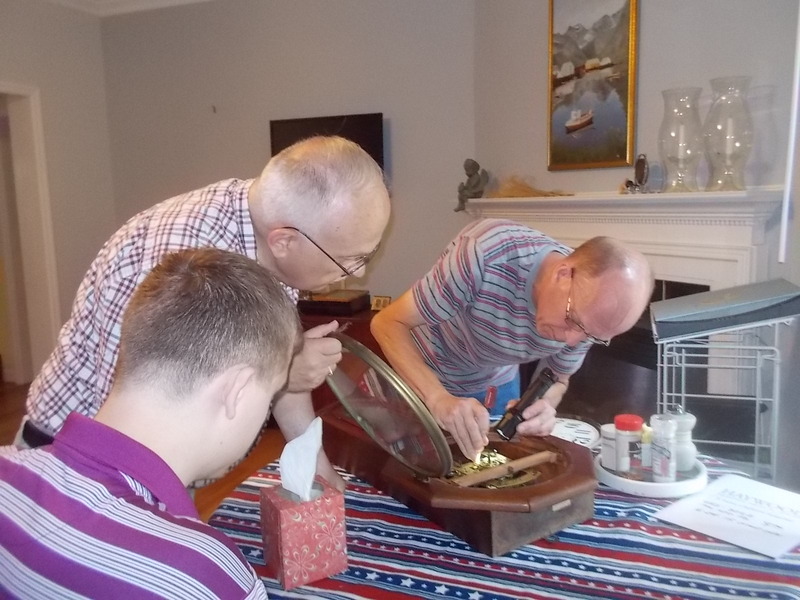 That’s where the clock had a new purpose, helping Dad set his hearing aids correctly before going out. It was still ticking steadily when we went there for his funeral.